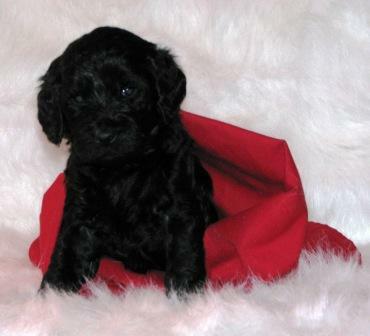 Here at Labradoodles of the North, your puppy’s health is of the utmost importance to us, therefore, we health test all of our breeding stock dogs. We will gladly show you your puppy’s parents’ health test results. Each of our puppies comes with a 2 year genetic health guarantee covering health conditions that are known to be genetic and that we can test our breeding dogs for. This is a Hip and Elbow test used prior to breeding specifically to address: Carpal subluxation, Elbow dysplasia, Epiphyseal dysplasia, Fragmented coronoid process, Hip dysplasia, Hypertrophic osteodystrophy, Multiple epiphyseal dysplasia, Muscular dystrophy, Osteochondrosis, Osteogenesis imperfecta, Patella luxation, and Shoulder dysplasia. We don’t want any of our puppies to suffer from hip problems so we pay careful attention to hip scores and breed only those dogs who pass testing. This one eye exam is used to identify 20 possible disorders including: Progressive retinal atrophy, Cataract, Coloboma, Dacryocystitis, Distichiasis, Ectropion, Entropion, Epiphora, Glaucoma, Hemeralopia, Iris atrophy, Lacrimal duct atresia, Lens luxation, Microphthalmia, Optic nerve hypoplasia, Pannus, Persistent hyaloid artery, Persistent pupillary membrane, Retinal detachment, Retinal dysplasia. PRA is a hereditary group of diseases that cause the retina to degenerate slowly over time. The disease results in declining vision and eventual blindness. “prcd” stands for “progressive rod-cone degeneration” which is the type of PRA known in several breeds. This is a hereditary disease, therefore, we pay careful attention to be sure that we only breed dogs that won’t produce PRA affected puppies. Canine congenital heart diseases are malformations of the heart or great vessels. The lesions characterizing congenital heart defects are present at birth and may develop more fully over time. Many congenital heart defects are thought to be genetically transmitted; however, the exact modes of inheritance have not been determined for all cardiovascular malformations. All of our breeding dogs will have passed a cardiac exam prior to joining our program. Type 1 von Willebrand’s disease is characterized by abnormally low production of a protein found in the blood called von Willebrand’s factor. This protein plays a key role in the process of clotting a damaged blood vessel. It’s important to us that each of our breeding dogs receive a clear result in order to be a part of our program.